The Hyderabad metro stretch between Ameerpet and Hitec City will begin service by the end of December this year. Hyderabad, Metro Rail News: Hyderabad Metro rail stretch of 10 km between Ameerpet and hi-Tech City will be opened by the end of his year, a top official said on November 5. The managing director of Hyderabad Metro Rail Limited (HMRL) N V S Reddy said the work was going according to schedule. “Metro work progress is pretty good and it is going as per schedule…before the end of December this year we will start the Ameerpet to Hi-Tec City line,” he said. Out of the 72 km long elevated HRRL project, the 30 km stretch between Miyapur and Nagole was inaugurated by Prime Minister Narendra Modi, last year in November. 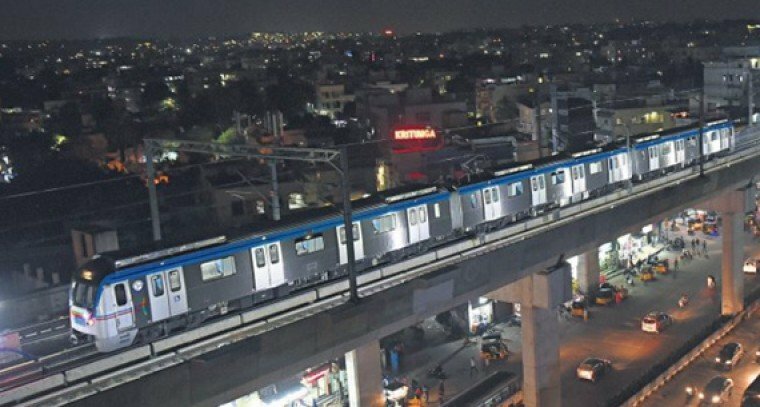 The opening of 16 km stretch of Hyderabad Metro Rail between Ameerpet and L B Nagar in September this year, has brought the length of the track to 46 km, and has earned the second spot in the largest metro rail network, after Delhi. Reddy mentioned that the Hyderabad Metro Rail project has been declared as the ‘Best Urban Mass Transit Project’ by the Centre. It has also earned the award of Excellence, which was presented to him and L&T Metro Rail (Hyderabad) Limited MD K V B Reddy jointly at the Urban Mobility India Conference held in Nagpur on November. The project has been termed as “unique” because of its features and appreciated by The Housing and Urban Affairs Ministry. It was called as an outstanding project with many engineering and financial innovations, as per N V S Reddy. “Hyderabad Metro Rail has emerged as a successful example of Public-Private Partnership initiative (PPP). It is an urban redesign and rejuvenation effort to transform the city into people-friendly green environ. Robust structural design, land pooling and other modes of revenue generation are other noteworthy features of the project,” states the Ministry of Housing and Urban Affairs. Delay in Ameerpet and Hi-Tech City route is paying us … all the best to this to come ….